Baytree Bakery is a family run bakery serving a variety of cakes, breads, hot drinks, pastries and sandwiches to appeal to all. Open from 8:00am to 5:00pm Monday to Saturday. Open from 8.30am to 5.30opm Monday to Saturday. 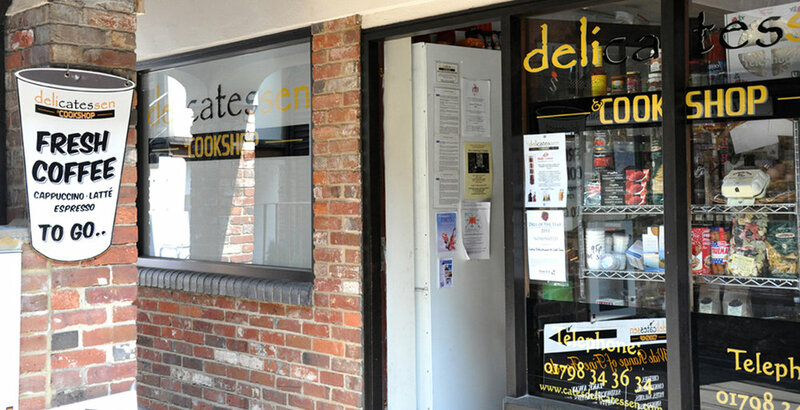 Cates Delicatessen and Cookshop lies at the heart of the town, a family run business incorporating a plethora of delicacies. Here you can put together the perfect cheese board with Cates’ wide range of cheeses and oatmeal biscuits (organic or gluten free). Host or enjoy a quiet evening in with our exclusive ‘ready made meals’ from our ’Dine’ range of around a choice of 30 meals, cooked, handmade from local Sussex chefs. You will also find the finest hams, including ham on the bone, salamis, pates, olives and organic extra virgin oil from 100% first press which is specially imported from Spain and is available at a fraction of the price, because you “pour your own”in refillable bottles. We also stock a huge range of infused oils and balsamic vinegars in a variation of 100, 250, and 500 ml bottles. Every day there is a keen selection of home made quiches, treacle tarts, cakes and sandwiches ready to take away. The smells are absolutely amazing, not to mention the extensive range of fine teas and Columbian coffee beans for your cafeteria which are stocked in the newly adjacent cookshop. This part of the deli also specialises in essential cooking and baking tools, providing customers with perfect choices of gift ideas with a wide range of fun, decorative and unusual kitchenware, including the latest gadgets. Cates Delicatessen and Cookshop is not only a super shop for picking up a cappuccino or a generously filled sandwich which you can also sit and enjoy in our new coffee lounge, but is a great place for all those luxury items we crave from time to time, such as superb CoCa Loco chocolate. During the summer months we will be open for those hazy lazy walk about days offering cappuccinos, lattes, cream teas and ice creams alfresco. Visitors to Petworth will find it impossible to walk past Hennings. Nestled between several designer boutiques and Antique shops, the Petworth branch is bursting with a huge selection of wines. Drop by on a Saturday after shopping for an in-store tasting.